Jacob died at the age of 147. His last seventeen years were spent in Egypt, numerically equal to the seventeen years Joseph lived in Canaan, before his brothers sold him into slavery. Midrashic and modern number crunchers have found reasons why Jacob didn’t attain the age of Isaac, 180, or Abraham, 175. This usually involves subtracting 17 from 147 to obtain 130, Jacob’s age when he complained to Pharaoh that his years had been few and difficult. After that, it goes beyond GCSE maths, and I won’t touch it. Jacob makes Joseph swear that his remains will be taken for burial to the cave of the patriarchs in Machpelah, today’s Hebron. As the end of Jacob’s life is drawing near, Joseph takes his boys Ephraim and Manasseh to visit their grandfather. Jacob tells Joseph that Ephraim and Manasseh will be like his sons Reuben and Simeon; this is a formula of adoption by which these two younger descendants gain equality with the two eldest. Jacob refers to the grief he suffered when Rachel died giving birth to Benjamin. Perhaps his adoption of these two grandsons of Rachel is a way of elevating the influence of her descendants among the more numerous descendants of Leah. When Ephraim and Manasseh approach Jacob, or Israel as he is called in this verse, he asks ‘Who are these?’ Like his father Isaac in old age, Jacob is barely able to see. Like Isaac, Jacob gives precedence to the younger child, crossing his hands so that his right hand rests on Ephraim and his left on Manasseh, Joseph’s first born. Jacob had taken advantage of Isaac’s blindness to gain the blessing due to Esau and now, for different reasons, he again subverts the custom of primogeniture. 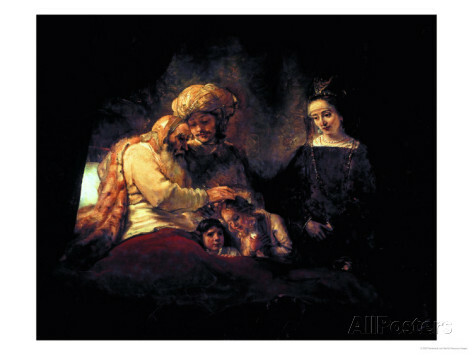 Joseph thinks this is a mistake, resulting from blindness or senility but we, who have read Genesis, know this is invariably the way: Cain, Ishmael, Esau, Reuben and now Manasseh are displaced by younger brothers, a theme which will be reflected later on in the kingship of David and Solomon. Jacob answers that he knows Manasseh is the elder, but Ephraim will be greater. Some people think this story is a retrospective explanation of the fact that Ephraim became the largest tribe of the northern kingdom. Jacob blesses both the boys in a beautiful poem, asking God who has been Jacob’s shepherd throughout his difficult life to bless the children, multiply their descendants, and identify them as the family of Abraham, Isaac and Israel. He assures Joseph that God will bring him back to the land of their fathers and expresses his intention to bequeath to Joseph, in preference to his brothers, the land which Jacob took from the Amorites, with his sword and with his bow. What is this inheritance which Jacob seized by force of arms, to give to Joseph? The word shechem means shoulder and there is an ambiguity as to whether shechem here refers figuratively to the portion Joseph is to inherit, or to the place Shechem, which, according to tradition, is the location of Joseph’s tomb. The verse becomes curiouser and curiouser when we remember that Jacob, who was not a fighter, rebuked his sons Simeon and Levi for attacking the city of Shechem, and there is no mention, in the Torah, of Jacob’s military exploit against the Amorites or any Canaanite tribe. Nevertheless, there is an account of Jacob’s wars with the Amorites and others, in a text called the Book of Jubilees. This is a reworking of Genesis, comparable to the reworking of biblical texts in midrash. Those who put a date to Jubilees tend to estimate that it originates around the Maccabean period, beginning about 165 BCE. Here are a few verses relevant to our sidra. Jacob sent his sons to pasture their sheep, and his servants with them to the pastures of Shechem. And [Jacob] arose from his house, he and his three sons and all the servants of his father, and his own servants, and he went against them with six thousand men, who carried swords. And he slew them in the pastures of Shechem, and pursued those who fled, and he slew them with the edge of the sword… and he recovered his herds. This later work develops the idea of a militaristic Jacob, quite unlike the plain man, dwelling in tents, whom we know from Genesis. The last verse of our Torah reading fits in perfectly with the story in Jubilees, so perhaps Jubilees draws on an earlier, now lost tradition about the wars of Jacob. Even without this warlike aspect, Jacob is an infinitely complex character: passionate, deceitful, astute, loving, long-suffering, pessimistic and devout. It is as if we get to know him more than we know the other patriarchs, and it is his name, Israel, which is our name.